We are happy to announce issue number 7 of David Report bulletin called Vulgarism. This new issue will take you on a trip into the ongoing convergence between design and art. Teapots in super size, huge Pinocchio dolls in mosaic, porcelain horse heads and knitted dogs. Is design flirting with art, or is it art flirting with design? What is it that we see; a smart merge between the two or an “easy” way to earn a buck and get massive PR, for both designers, producers and gallery owners? To get some further indication we have asked Oliver Ike, Giuliana Stella and Christian Geissbühler to give their views from their particular insights and standpoints. Click the image above to read Vulgarism. And yes – it is free, thanks to our sponsor Absolut. 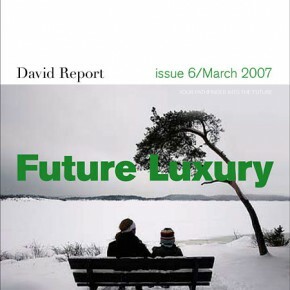 New issue of David Report bulletin. The new issue of David Report bulletin has arrived. It is called “Communication Through Product”. You can read it here. Do you agree about what we say, or do you think we are totally out in the blue…? We would love to get feedback from you!